Crypto Valuation: How important is circulating supply? I believe that if you invest $1,000 in the right coins today it could make you a millionaire within the next 5 years but how do you pick the coin? What is it that decides the eventual price? I’ll be exploring that in this series by looking at the different elements that impact on a coin’s price. I’ve chosen to start today by looking at circulating supply. I have picked circulating supply because it is an estimate of the number currently in circulation. Why should circulating supply matter? The value of cryptocurrency at any one point in time is completely governed by supply and demand - the value of a coin is the meeting point between what people are willing to sell it for and what people are willing to pay for it. Circulating supply is the number of coins available at any one moment, i.e. 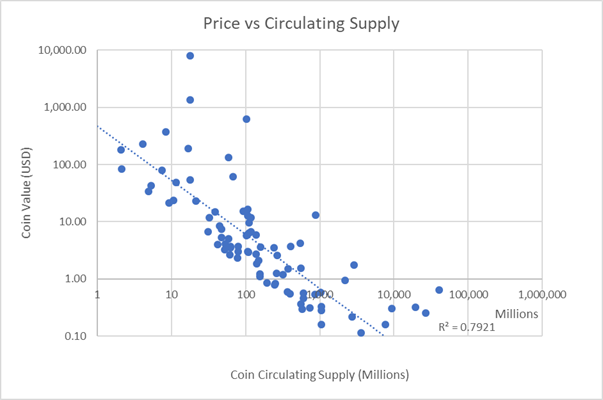 it is the ‘supply’ in supply and demand so intuitively the lower the circulating supply is the higher the price should be. As a simple example, if you have 4 lambos and 100 people trying to buy them you will get a much better price ‘per lambo’ than you would selling 120 lambos to the same 100 people. 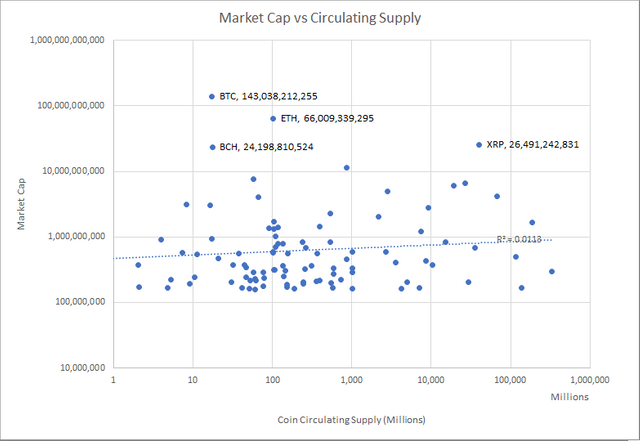 Does circulating supply matter in cryptocurrency? So we have established there should be a relationship; a higher circulating supply should mean a lower price. Note that to get a sensible graph I have had to use log scales otherwise the value of BTC and the circulation of Ripple would make most of the coins illegible. 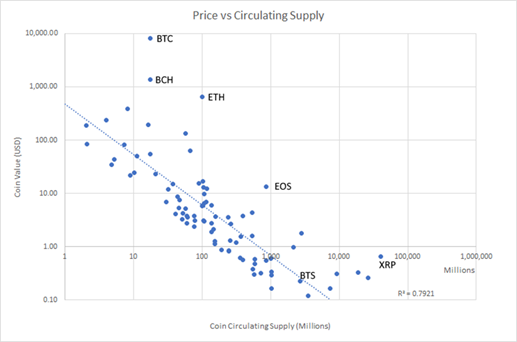 As it turns out logarithmic is probably the way to view crypto as the graph pretty much shows what we were expecting to see – the value of coins tends to fall as we increase the circulating supply. The R^2 value (a statistical measure which shows how closely data is fitted to the dotted regression line) is 0.7921. If this figure was 1.0000 then it would mean the price of a cryptocurrency is completed defined by its circulating supply, if it was 0.0000 then it would mean the circulating supply has no impact on coin value. The biggest outlier is BTC. Does this mean its due for a massive correction to bring it down to the trendline? In my view no. I think that what this chart is showing us is that generally a coin’s value is linked to its circulating supply but that when mass adoption/interest occurs the potential for breakout is huge (bear in mind we are on logarithmic scales here so a little upwards movement can be a massive increase in price!). Bitcoin Cash has succeeded in securing interest and adoption as a faster alternative to BTC. Ether has made itself a standard for token launches. Ripple is a classic one where arguably the interest and adoption they have managed to achieve has led to a price which is disproportionate to both the technology and the available supply. EOS is a potentially game changing technology currently generating more excitement and FUD than any pre-launch coin I can think of for a long time and you can see that has allowed it to break free from the trend line. Interestingly the chart does not show any coins in the top 100 as hugely undervalued and I think the big lesson here is that there needs to be ‘step change’ in adoption / interest for a coin to really break upwards. To try and look at that a little closer I chose a coin I believe is massively undervalued and marked it on here – Bitshares (BTS). This is (in my view) a coin that should be at a minimum of $3-4 because of its insanely fast transaction speeds, low fees and smart coins but is currently sat at $0.23. Despite what seems to me a complete undervaluing it turns out it is one of the coins that sits most closely to the trendline. I think this just underlines the importance of adoption and interest to the success of a coin. Maybe a weakness of decentralisation and not having a central marketing team pushing the coin forward. I’ll be looking at the ‘demand’ side of supply and demand in my next post. Comment and thoughts welcomed below. Thanks for the positive response. I thought I would just add a couple more to look at what other impacts circulating supply may be having. 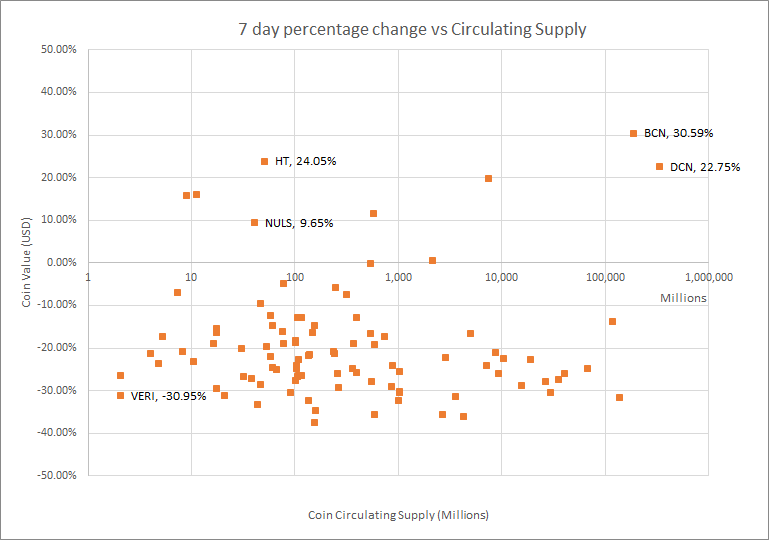 Firstly does the circulating supply have any effect on percentage change? i.e. does having more or less coins in circulation provide you with any protection to the 'BTC dump effect' that brings down all the other coins with it? There is no line you can draw which gives a decent R^2 value or any sense of a real relationship. We can therefore conclude there is no benefit seen for high or low circulating supply coins - when BTC dumps it drags down most with it! I've marked on a few of the outliers just for interest - its been a good week to be in Bytecoin! What impact does circulating supply have on total market cap? You can see from the chart it appears to have almost no impact. You have the same few breakout coins marked on there which have left the rest behind but generally the cap is completely independent of the circulating supply. This makes sense as we showed in the initial post that there is a relationship between circulating supply and individual coin price. There is a good spread of circulating supply figures for the top 100 coins in general, so it appears investors are pretty comfortable with both high supply and low supply coins. You said BTS but also STEEM is undervalued having similar technology . This post has been great. Good work man. Haha 342 or bust man! ✅ @matle85, congratulations on making your first post! I gave you an upvote! Great post, I have often wondered about circulating supply and how that can affect a price. I also liked the point about marketing, because any way you look at it it’s needed. And if it isn’t there, it can be detrimental to the long term success.